My husband and I have decided it’s time to change our eating habits to be a bit healthier. This includes watching our portion sizes and making sure we eat enough fruit and vegetables. To help us with this we started a running program that included an eating plan. The meal plan is helpful, but does not include recipes for the menu items. One of the meals included steak, onion, and pepper kabobs. That was all I had to go on, I had never made kabobs before. I like a good steak, but it is not a food we eat very often. I am also not one for just cooking meat without seasoning. I feel that marinated steak is sometimes better than non-marinated steak. I set off reading about marinades and looking at marinades I already like. We have not been the greatest on keeping up with our running plan, but we have been keeping to the meal plan. It is so nice to see us adding in more fruits and vegetables to our meals on a regular basis. Sometimes I just cannot face a vegetable, but including them in the main dish is so helpful, not only for me, but for the kids too. Then sometimes just putting it on a stick makes it better, kabobs are good for that. I have loved mixing things together and eating better on a regular basis. This meal I was worried about at first, peppers and onions are not my favorite, but this meal will be coming back in the future whether its on the meal plan or not. I may just substitute it in every now and then. In a resealable plastic bag mix EVOO, Worcestershire Sauce, garlic, mustard, and black pepper. Put in meat. Let meat sit in marinade for 4 hours or more if desired. (Mine went just over 12 hours). 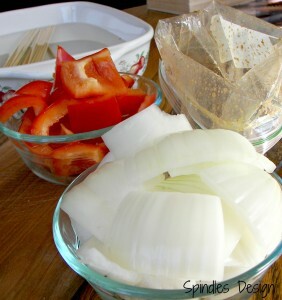 While the meat is marinating, cut the onion and bell pepper into just bigger than bite size and soak the skewers for at least 30 minutes in warm water. Once everything is prepped if cooking in oven turn oven on to 350 degrees. 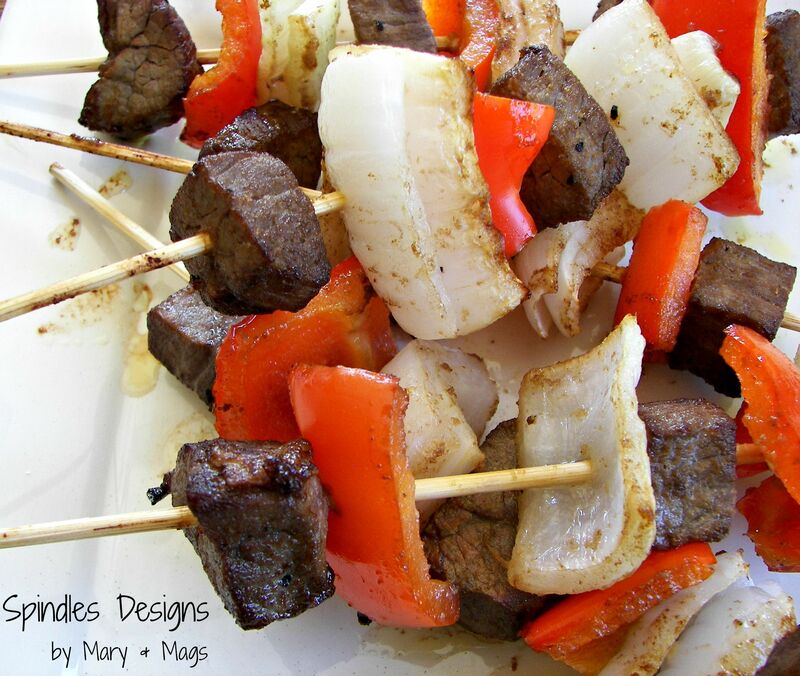 Put meat, pepper and onion on skewers. I like steak more than peppers and onions so I made sure each skewer had 3 pieces of meat until meat ran low then I did two per skewer. Line the skewers up on a cookie sheet. Bake for about 25 minutes. I rotated my skewers about every 8 minutes. Yum!! 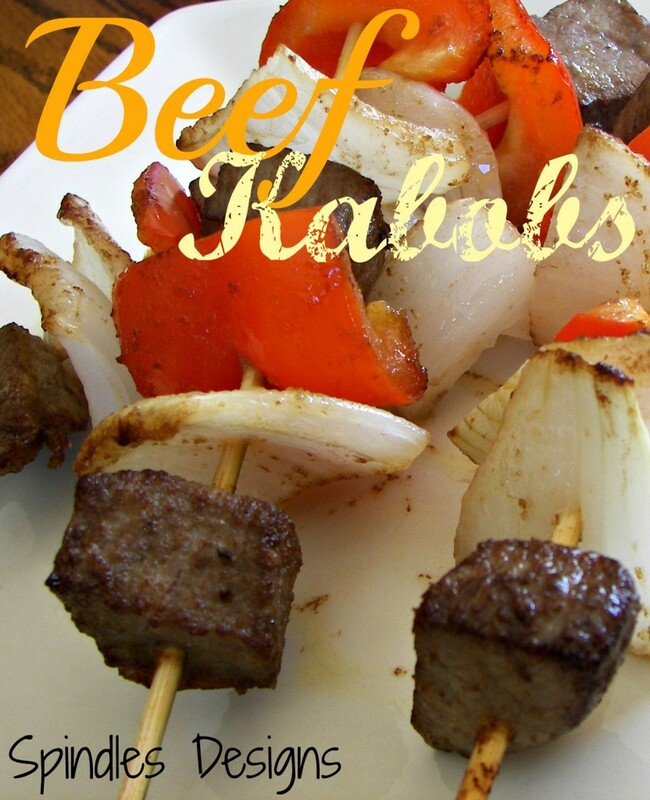 I love kabobs and this marinade sounds awesome. I would love for you to share over at tonight’s Throw Back Thursday link party!